Zavier Marshall of Eagle Hall Primary skilfully eludes this tackle from Trinity’s Jai Alleyne. 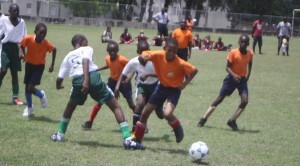 Last year they provided cannon fodder for most if not all the teams in the Bico-sponsored National Sports Council’s Primary Schools Football Championship. Not so this year for Trinity Academy. Today at Passage Road, St. Michael the young boys and one girl of the academy turned on the pressure on Eagle Hall Primary in the second-half of their match-up to emerge with a 3-0 win. The improvement in the team is noticeable and after a first half where there were few opportunities made by either side, Trinity Academy came out with greater purpose in the second period. They were rewarded for their industry when a melee in front the Eagle Hall custodian Nathan Hewitt resulted in an alert Kirk Lambert netting the first goal. Special mention must be made of Robyn Sobers who had a great game for Trinity in the mid-field and on the left flank. Never afraid to tackle the bigger boys, she often ran into good positions and it was on one of these runs when she collected the ball on the left-wing, moved inside and slipped a defender before passing on the ball to Trokine Mottley who scored the second goal with a solid strike into the top left corner of the goal. By this stage with their confidence very high, Trinity continued to move the ball frequently into their opponents half. Eagle Hall hardly got off a shot at Trinity goalie Keegan Eastmond with solid defending by Academy’s Nikolai Greenidge, Kamario Grant and Darien Daniel being the feature. The Academy’s third goal came five minutes from time when Markhali Downie benefited from an Eagle Hall defender attempting to replicate a basketball move in the penalty area when he pulled the ball from the air as though taking a rebound. Downie made no mistake from the penalty spot.In an earlier game also at Passage Road Wesley Hall defeated St. Mary’s 1-0. Defending champions St. Gabriel’s again served notice on the rest of the teams with another commanding victory when they comfortably defeated Bay Primary 5-1 at Blenheim. Asher Jean-Pierre netted a brace of goals as did Samuel Akins, while Kyle Lewis scored his second goal of the tournament. Rossy Nicholls got the consolation goal for the Bay Primary. In an exciting battle between Mount Tabor and St. John Primary at Market Hill, Tyrese Bushell and Aaron Ward scored a goal apiece to cancel out Acobi Payne-Garnes strike as St. John Primary emerged victorious.At Chapel, St. Philip Primary’s Zavion Nurse and Miguel Mondesir scored in their school’s 2-0 win over St. Luke’s Brighton.